Eldest son of James Turpin, Lace Manufacturer and Elizabeth Hart, youngest daughter of Edmund Hart who died aged 57 before E. H. Turpin was born. Born 4 May 1835 in Narrow Marsh (first born). Four other children were born - two sons and two daughters. Second son Samuel was a scenic artist. Two daughters came between the two younger sons. Both died in infancy - May at 12 months and Anna at 8 months. Third son, James Turpin, born in Nottingham on 15 December 1840 and died in Brighton on 29 July 1896. He was an excellent musician by all accounts. Edmund was not a punctual person, except for services and recitals! He was aged 9 when he began to learn to play the piano. His first organ lessons were from Charles Noble of St Mary's Parish Church, Nottingham. In 1847, then aged 12 he became the organist of Friar Lane Congregational Church. He became the conductor of the Band of the Robin Hood Rifles. Turpin gave a recital on the Gray and Davison Organ of the Great Exhibition in 1851, then the Crystal Palace. In 1857 he married Sarah Anne, 2nd daughter of Robert Watson of Whitemoor at Old Basford. One daughter was born to them. He made his home in London but travelled (often at night) back to Nottingham. This was a great strain so he resigned from the Cathedral about 1865 and settled in London. He became organist of the Catholic Apostolic Church, Bloomsbury Square. Turpin wrote an oratorio called 'Hezehiah' the score of which was lost in a fire. His first wife died and he re-married Sarah Hobbs on 2 May 1905. Turpin was organist of St Brides, Fleet Street at the time of his death in 1907. A hymn tune 'Mansfield' set to the words 'On the Resurrection Morning' (No 499 of the old ed. of Hymn A&M - and others). James succeeded his elder bother Edmund as Organist of Nottingham Cathedral, afterwards becoming successively organist of Londonderry Cathedral, Berkampstead Parish Church and St Andrews in Watford. He was an excellent musician, being amongst many other good things, a capable organist and a painstaking teacher. He achieved his FRO in 1875 and graduated MusB at Cambridge in 1880. He was active as an organ recitalist, organist, pianist and lecturer. As an organist he was well known and gave many recitals, including at the Royal Albert Hall during the International Inventions Exhibition in 1885. He was Professor of Harmony and Counterpoint at Trinity College, London and music master at Berkhamsted School. James also gave lectures before the Royal College of Organists and the Musical Association. 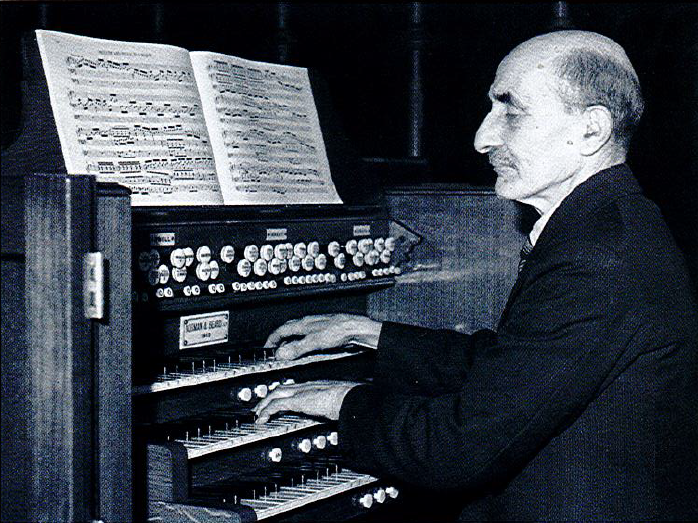 Whilst the organ was in the capable hands of W. G. Taylor, Cathedral music had its peculiarities. Mass was sung by a combined men's and women's choir to the music of Mozart, Gounod, Haydn and other composers of the operatic school. In fact whenever the Carla Rosa or the Moody Manvers Opera companies appeared at the Nottingham Theatre Royal, members of these companies would appear in the Cathedral choir stalls as soloists. Frank, son of Edward George Taylor, studied at Leipzig Conservatoire and was a friend of Edvard Grieg. Before coming to Nottingham, Bishop Dunn had been Secretary to Cardinal Vaughan at Westminster and brought with him the ideals of liturgical and musical culture which were then being established by Sir Richard Terry, the Master of Music there, and so the theatrical music of the time was replaced by dignified and reverent chant. The restoration of plainsong (Gregorian chant) was reflected in the Cathedral liturgy. The Cathedral mixed choir of the time resigned 'en bloc' and a group of young boys was gathered by Father Henry Hunt (later a Canon of the Cathedral Chapter and Administrator, 1926-1930), an assistant priest of the Cathedral at that time, to sing the liturgical chants so much desired by Pope St Pius X (who was Pope 1903-1914) and Bishop Dunn. Many of Father Hunt's boys became choir men in later years. The boys' choir eventually faded away after the departure of Canon Hunt in 1930 to St Hugh's Lincoln, and the few remaining men continued to support the liturgy as best they could, even throughout the war years of 1939-1945. 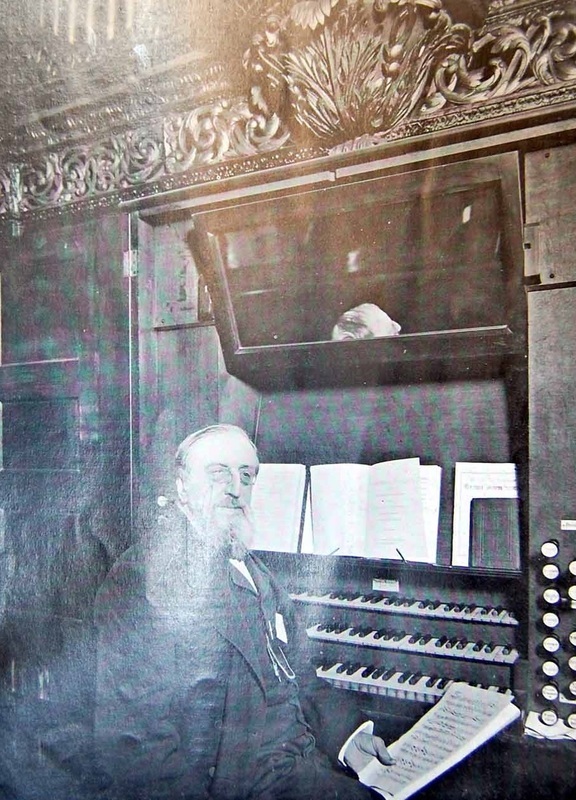 Throughout all these years and beyond, Frank Taylor, the Cathedral's third official organist appointed in 1905, provided devoted service until his death in 1963. The long-established tradition of Gregorian chant from the time of Bishop Dunn was continued throughout the 1940s, 50s and into the 1960s with Frank Taylor as Cathedral organist. 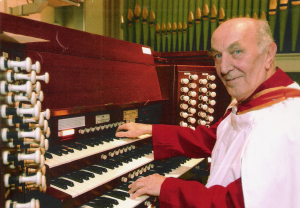 Peter Smedley was appointed Director of Music and Cathedral organist in 1964 after Frank Taylor's death in 1963 and maintained this long-established tradition of Gregorian chant, adding to it especially the work of the polyphonic schools. The Sunday 11.15am Mass with virtually all the singing in Latin testified to his determination to maintain the traditions of the Church in this respect. Earlier in 1955 a boys' choir had been reformed by Peter Smedley in preparation for the reforms initiated by the Second Vatican Council. Many of these boys were draw from the nearby St Mary's School (since demolished) associated with the Convent of Mercy and the neighbouring St Joseph's Preparatory School. This choir remained a going concern for many years until it became increasingly difficult to obtain choristers from the schools committed to two practices a week and a service each week of the year. 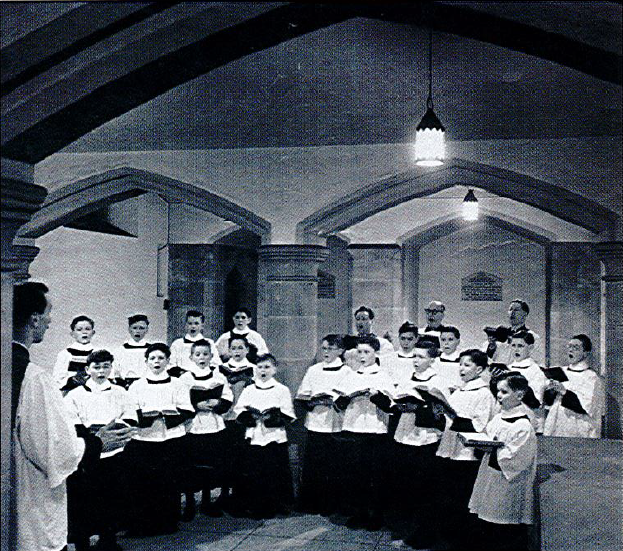 This boys' choir did however repay with some benefits; a number of of these 'old boys' became men of the choir until 1979, when it was decided to reform the Cathedral choir and an appeal was made for both men and women to form a mixed choir. In the nineteen sixties and early seventies Peter Smedley was much involved in the then flourishing Pueri Cantores movement. He had built up an excellent Boy’s Choir in Nottingham Cathedral. His work was much influenced by the ideas of that fine conductor and harpsichordist George Malcolm, a visionary who was also the Master of Music at Westminster Cathedral who revolutionised the accepted ideas of boy’s vocal training. George questioned the then prevalent and ubiquitous ‘Anglican Hoot’ saying that one could only hear and understand the boy’s natural voice if one listened to them at play. George Malcolm’s ideas are now generally accepted and Peter Smedley was in the forefront of this change. I heard his choir on a number of occasions and his achievement was impressive. Peter was much involved in the development of the Pueri Cantores Summer Schools. These took place in Westminster Cathedral’s Choir School during August. They were residential (over thirty boys taking part), lasted for two weeks and had a great influence on boy’s choirs within the English Catholic Church. Unfortunately they were only allowed to happen on two occasions. However, they were much enjoyed by both students and staff. Under the direction of that great and sensitive priest, Wilfred Purney, they gave participants a sense of the standards to which liturgical choirs should aspire. Great music was sung. Including William Byrd’s Five Part Mass with the Cathedral’s professional Lay Clerks, individual lessons in vocal production were given and the participants sang at the Cathedral’s Services to the delight of the worshippers. (It is interesting to recall that one of the participants was Sir Nicholas Kenyon who eventually became Director of the BBC Proms.) Peter Smedley was a great influence on the Summer Schools and his wise advice always invaluable. Peter was a delightful man, unfailingly courteous, always considerate and invariably helpful. He gave me continual encouragement in my own work and I have the happiest memories of my all too brief association with him. Requiescat in Pace. Peter Smedley, former Director of Music at St Barnabas’s Cathedral Nottingham, died on 18 October 2012. When he retired ten years ago he came to the end of an association with the Cathedral of some fifty-seven years: he had begun as pupil-assistant in 1945 and became assistant organist in 1958. The director of music at that time was Frank Taylor: he had been appointed in 1905 (in the days of the original Gray and Davidson organ before the arrival of the Norman and Beard instrument which survives, altered, today) and as a student had once had tea with Grieg. Long before that one of the organists at the cathedral had been Edmund Hart Turpin, a founder of the Royal College of Organists whose name is perpetuated in the Turpin prize, one of the most prestigious awards given by the RCO. ​After a short time as assistant at Westminster Cathedral, Peter Smedley succeeded Frank Taylor as director of music in 1964. He brought to the post a deep knowledge of plainsong which he had studied with Henry Washington of Brompton Oratory, Dom Jean-Hébert Desroquettes of Quarr Abbey and Dom Jean Clair at Solesmes. At the time of “the changes”, the only cathedrals to maintain the regular use of Gregorian chant in the liturgy were Westminster, Liverpool Met and Nottingham. This remained the case at Nottingham throughout Peter’s “reign”, that is to say throughout a period of constant liturgical change and despite an over-zealous interpretation of the Constitution on the Sacred Liturgy in the nineteen-seventies which resulted in the dismissal of the men’s choir (founded initially to enact the Motu Proprio of Pope Pius X which re-established the use of plainsong) and which caused much bitterness and anguish. However Peter’s calm determination and diplomacy ensured that plainsong never disappeared from the Cathedral during that distressing time. The presence of more sympathetic clergy since then has created a climate where Latin is a living liturgy, where music is welcome (as witness the regular organ and choral recitals) and where a great tradition, maintained and developed, has been handed on to Peter’s successor Neil Page. Following the retirement of Peter Smedley in 2003, Neil Page was appointed organist and Director of Music supported by Graeme Vernon as deputy organist. Through the introduction of choral scholarships awarded to students in full-time University education in Nottingham, the choir was re-structured. While the tradition of Gregorian chant has been maintained and developed, the repertoire has been enlarged to include such composers as Britten, Stravinsky, Vaughan Williams and Tavener. 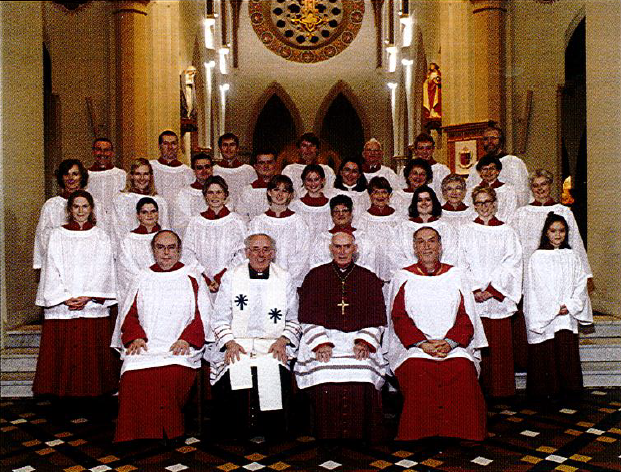 A Cathedral Youth Choir was also established in 2003 as a result of the initiative and enthusiasm of Sarah Smith (now Taylor) who at the time was in her final year at the University of Nottingham and one of the Cathedral's first choral scholars. Following his initial choral experience as a choral scholar in the choirs of Durham Cathedral and Trinity College Cambridge, Neil Page studied singing as a postgraduate student at the Royal Academy of Music. Having been Director of Music at Hurstpierpoint College and Malvern College, in 1985 he was appointed Director of Music at Uppingham School and Conductor of the 200-voice Nottingham Harmonic Society Chorus. He has conducted all the major works of the choral repertoire working with several of the principal British orchestras including the RPO, RLPO, CBSO, Halle and BBC Concert Orchestra. ​He was Director of Music at St Barnabas Cathedral from 2003 – 2014, overseeing the introduction and development of the choral scholarship scheme. He has been a diploma and grade examiner for the ABRSM for over 30 years in which capacity he has toured throughout Africa and South East Asia. He is Honorary Choral Adviser to the Hong Kong Children’s Choir. In recognition of his work with youth and adult choirs he has been awarded a Winston Churchill Memorial Fellowship. When Neil Page retired in 2014, he was succeeded by his Assistant Director of Music, and Composer-in-Residence, Alex Patterson as Director of Music and Robert Gower as Organist. Ellie Martin joined the team in 2017 in the new role of Youth Choir Director.